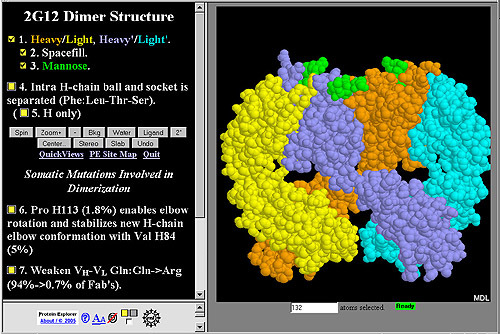 PiPEs present author-designed rotatable 3D molecular structure views. Each button shows a different view, accompanied by an explanation and color key. Because PiPEs are within Protein Explorer, the user can move seamlessly into self-directed exploration of any view, then back into the formal presentation. More.. Snapshot of a PiPE on a surprising, domain-swapped antibody structure. Example PiPEs: Some bundled with PE, some elsewhere. Included are examples of ConSurf results. About PiPEs: Background, rationale, methods for authoring. * These links will not work until you have added personal content, following the appropriate instructions.